The modern Greeks have a healthy diet and a very long life-expectancy. And absolutely stunning views of the mountains and ocean. Maybe some of all of these things has to do with their beloved Feta cheese. A story covered by the Daily-Mail describes a new study that came out in the past two weeks. It is from the work of a Greek researcher (of course!) at the University of Lincoln in the UK. Microbiologist Panagiotis Chanos reported to an esteemed microbiology society in England that Feta cheese has many natural, lactic-acid containing bacteria that function as strong antibiotics in the body. 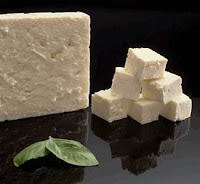 Panos studied the raw milk and feta cheese produced at 40 small farms, in the Macedonia region of northern Greece, and used samples of raw Feta from each for his experiments. He was able to demonstrate, in vitro, that the bacteria in Feta are able to kill many virulent, food-poisoning bacteria, like Listeria, that the human body has much difficulty with. At Fromagedumois, we give our hat's off and three cheers to Dr. Chanos. We always suspected that something would come to justify the lovable, lactic-y Feta taste. thanks to seth and ricky for providing these fascinating fromage facts! as a lover of all things salty, i’ve always been an enormous fetafan. cured in brine for several months to ensure its saline tanginess, feta is an excellent addition to salads, pizzas, and even pastries. i also quite enjoy eating it plain. or perhaps complemented by a small plate of warm, marinated olives. mmmmm. but who knew that this salty crumbly delectableness was also good for our little fromage-loving tummies? i’m pleased as punch to learn that feta contains these “friendly bacteria” that may help to destroy more mean-spirited bacteria like listeria. which, as you’ll know if you’ve clicked on fdm’s link for listeria, is a very, very good thing. what we may have on our hands here is a veritable supercheese: saving children, the elderly, and gastrointestinal tracts of all ages while simultaneously upping our levels of gustatory pleasure… it’s not a bird or a plane but, rather, a fromage. ps excellent work on the incredibly zen fetaphotog. it’s feng shui for fromage and i approve.